Slider is the most engaging element of any Website. When these sliders are combined with page builder the level of its usage takes one more step towards flexibility. If you are using Page builders such as Visual Composer, Divi Builder, SiteOrigin page builder or any other builders, this tutorial will help you add SliderVilla carousels using those builders. For a slider to be used in page builder is expected to have the ability to generate shortcodes & provide widgets. These shortcodes then can be used to place in to page using page builder text editor widget. 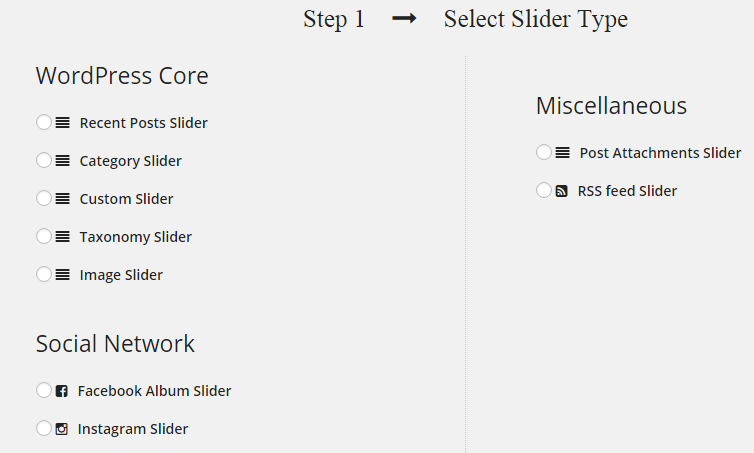 We can also directly use widgets of slider into page builder. 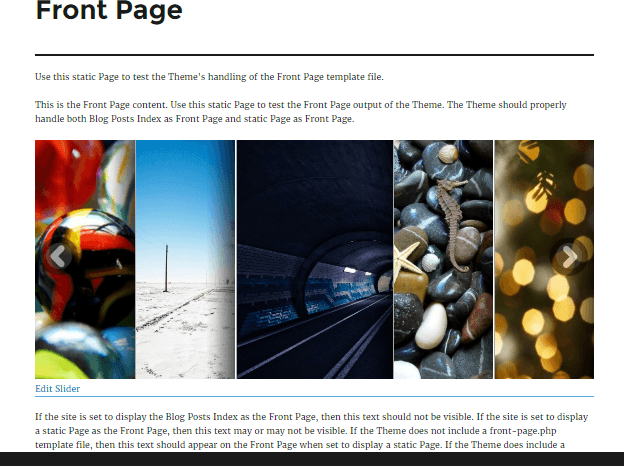 Here we will see how to add premium WordPress Sliders using a page builder. In this, we have used Premium Akkord Slider with SiteOrigin page builder. NOTE: This will be in reference to the Akkord Slider, steps are same for other sliders in SliderVilla. Step 2) Download the zip file of SiteOrigin page builder and add it to the plugins folder of your theme. Go to dashboard and activate the plugin. Select one from the multiple slider types and keep following the steps and instructions given in the slider to create an amazing Akkord Slider. 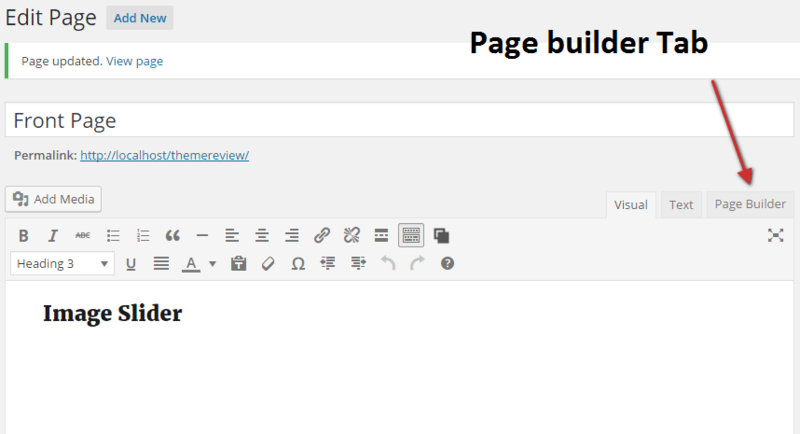 As you have activated the Page builder plugin you will see a page builder tab appearing on editor. Click on it. Now depending upon your choice select whether you want to display a category slider, a recent posts slider or a simple image slider. After selecting any widget fill title field and slider & settings. Following these few simple steps will let you build an awesome page with appropriate slider appearing in it. P.S. 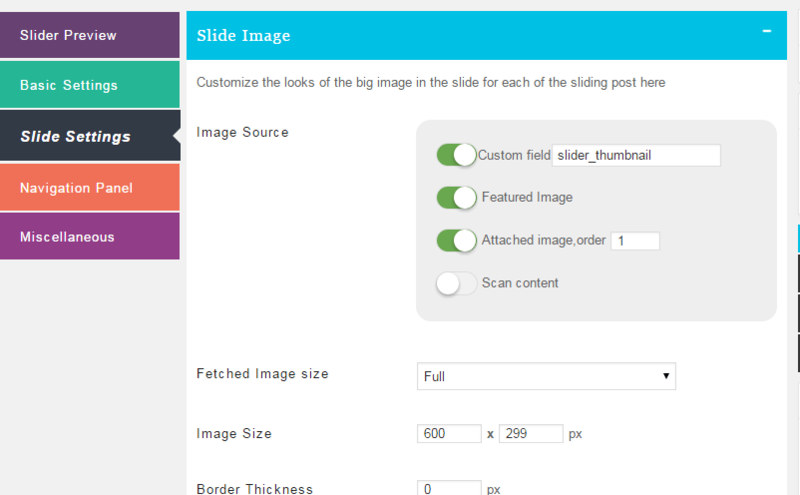 All WordPress sliders of SliderVilla comes with shortcode and widget options. It means if you are using Page builders such as SiteOrigin Page Builder, Divi Page Builder, Visual Composer or any other builders, you can easily add SliderVilla sliders inside the pages. There are times when you want to add the Sliders in WordPress site based on certain taxonomies. Taxonomies is the way to group the things together. The best grouping mechanism for categories and tags is through taxonomies. 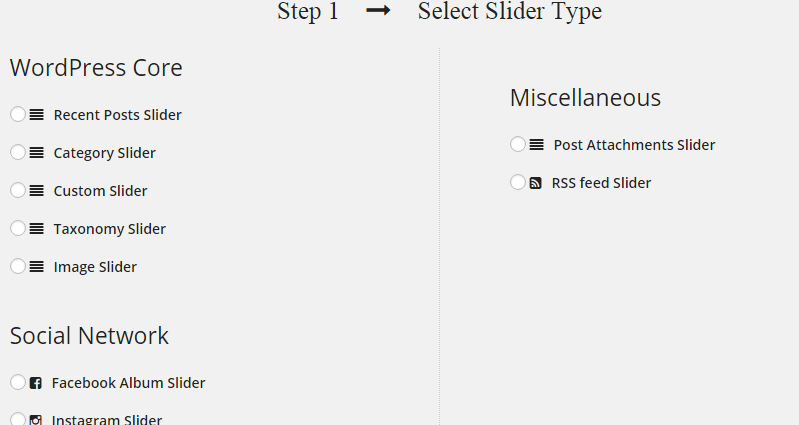 All WordPress sliders of SliderVilla supports to add Tag Archive Sliders very easily. Step 1] In order to use the Pointelle Slider to add the tag archive slider, one needs to download the zip file and add it to the plugin folders. Ones the plugin is activated you will find the Pointelle Slider option in the admin panel and also the related settings can be done from here. 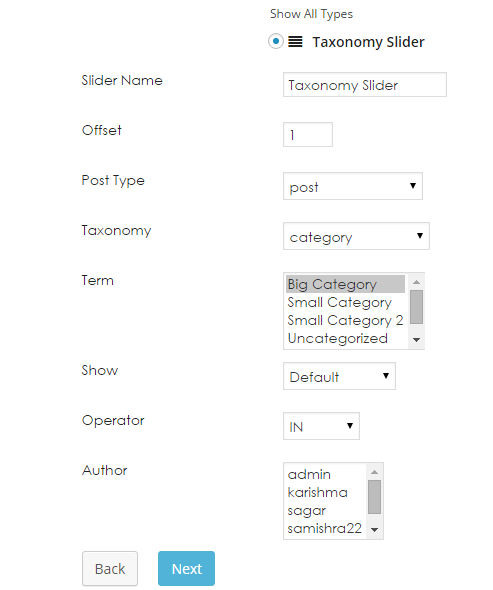 One can select different taxonomy from the drop down such as category, post_tag or the post_format. The terms will be displayed depending upon the taxonomy that is selected. Step 3] Select the Skin and Layout for the Slider. An Easy Builder will appear where one can change all the settings related to the particular slider. Following the three simple steps one is able to add tag archive slider with the WordPress website. All the sliders of SliderVilla is compatible with adding tag archive slider in WordPress which makes it easy to select different categories, tags and post formats. A website can be considered as a hub for all the social media profiles. Though you have the best content, superb plugins and themes but a website without the representation of brand or logo is incomplete. Scrolling images or Brand slider are an extremely effective and powerful way to draw the customers and to publicize the brands that are supported by you. It is easy to represent all the details of the brands and logo images towards the bottom of the website. Without much efforts the visitors can have a look on all the brand images that is supported by your website. Thus it makes the work quite simpler. It maximizes the ability to increase the awareness and brand loyalty among the customers. They get to know about the brands that are offered by you in a better way so this will built trust among the customers. Representation of all the brands along with the details will showcase the products that you support. This will give rise to the competitive spirit in the market and help to know your business in a better way as compared to others. The visitors who visit your website for the first time and go through scrolling brand images will give a good impression for them. This will surely change the outlook of the customers and give a good feedback of the product that is offered. There are many WordPress plugin that are available but there are only few that will guarantee scrolling image slider for WordPress CMS. One such slider is the Placid Slider which is the most recommended scrolling image slider. It is best suited for Logo or Brand images slider and which is mostly found on the footer area of the websites. Ones the plugin is activated you will find the Placid Slider option in the admin panel and also the related settings can be done from here. Depending upon the Slider type that is selected fill in the details for it. Step 3] Select the Skin and Layout for the Slider. An Easy Builder will get appeared where one can change all the settings related to the particular slider. Following the 3 simple steps you are able to create Placid Slider and include the logo and brand for your website. You can include number of brands and logo with responsive design, continuous scrolling action and Grayscale effect with the Placid Slider. Placid Slider can be considered as a great way to represent all the Logo Slider and brand images in no time for your website, thus making your work much simpler! NOTE: This will be in reference to the Pointelle Slider, steps are same for other sliders in SliderVilla. Step 1] In order to use a Pointelle Slider to add dynamically fetched latest posts sliders, one needs to download the zip file for Pointelle Slider and add it to the plugin folders. Ones the Plugin is activated one will find the Pointelle Slider option on the admin panel and also the related settings can be done from here. Step 2] Enter the name of the Slider and proceed to the next step. Step 3] Select the Skin and the Layout for the Slider. An Easy Builder will get appear for it where one will find all the settings of the slider and changes can be done accordingly. Using the Shortcode and Template tag, it can be used to display it on the front end. Following these 3 simple steps one can very easily add Dynamically Fetched Latest Posts Slider in WordPress in no time. Believe me, it takes less than 20 seconds to have a nice slider with dynamically fetched posts. All your future posts will automatically start appearing inside the slider. Google fonts are the free and open source fonts that are served by the Google Servers. These are very attractive fonts that goes very well with all the websites. There are variety of them that are available and one can easily make the choice for it. 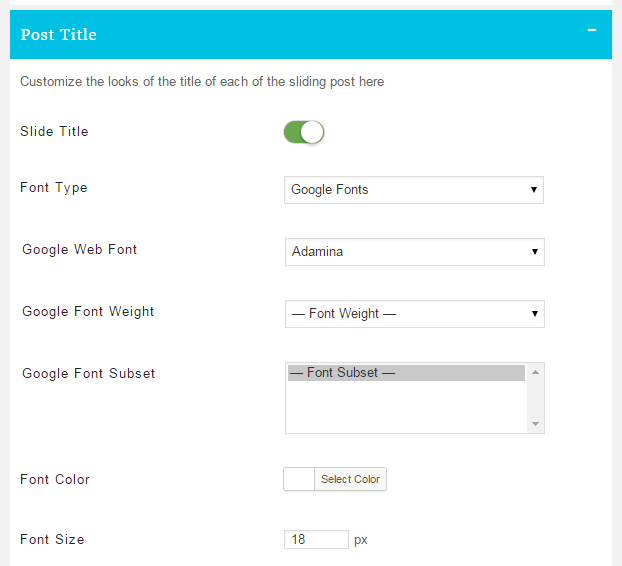 One can easily implement Google Web Fonts for all the WordPress sliders of SliderVilla. Step 1] In order to use the Pointelle Slider to use the google web fonts in WordPress Slider, download the zip file and add it to the plugin folders. After the plugin is activated one will find the Pointelle Slider option in the admin panel and all the settings related to the Pointelle Slider. 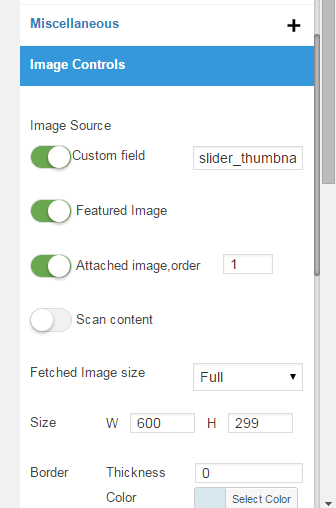 Slide Settings Section is again divided into 3 subsections (Slide Image, Post Title and Post Content). One can easily implement the google fonts for the title as well as the content of the Sliding Post from here. Select the Font Type >> Google Fonts. After the choice is made for the Google Fonts select Google Web Font, Google Font Weight and Google Font Subset from the drop down which is again user defined. Save the changes and the particular settings get applied to all the sliders of the SliderVilla. An Easy Builder gets appear for the Slider that is selected. Towards the right it consists of various settings that can be applied. For Text Controls and Navigation Panel one can select Font >> Google Font. Make the choice for the Google Web Font, Google Font Weight and Google Font Subset from the drop down that is user defined. This setting gets applied to the particular slider that is selected. Thus following these 3 simple steps one can make a choice to use the Google Web Fonts for the Sliders which is user defined. Images plays a very important role in giving light to the content that has been published. They tend to be an eye catcher for the content that has been published by you. When one decides to use a WordPress Slider then one of the query that arises in his mind is How to get the images from the Post for the WordPress Slider? 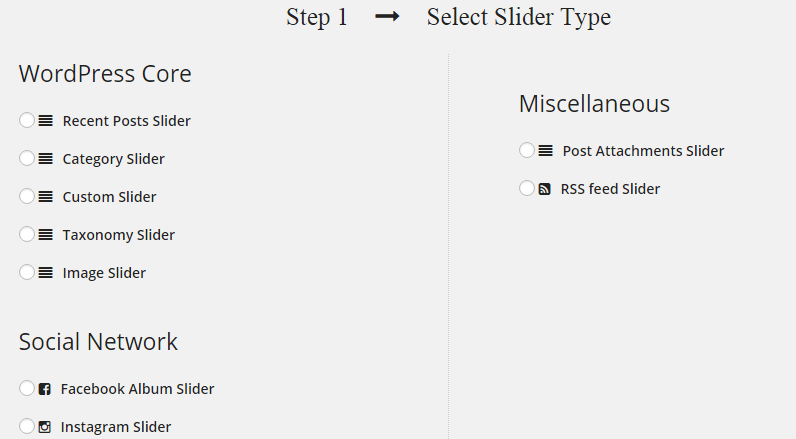 The WordPress Plugin that has helped to resolve this question is all the Sliders of SliderVilla. All these sliders are capable of auto fetching the images from the post that can be easily used for the WordPress Slider. Step 1] In order to use the Pointelle Slider to auto fetch the images from the post one needs to download the zip file for Pointelle Slider and add it to the plugin folders. Ones the plugin is activated then one will find the Pointelle Slider option in the admin panel and also the related settings can be done from here. Fill in the details for the Slider type depending upon the choice that is made. Step 3] Select the Skin and the Layout for the Slider. An Easy Builder will get appear for it where one will find all the settings of the slider and the changes can be done accordingly for it. There are the above 4 options for the Image Source that are present and the choice can be made accordingly from the source from which the image is to be fetched. If the Custom field option is enabled then one needs to mention these details for the Post. Go to the particular Page/Post. Towards the bottom one will find the option to add the Custom Fields. Select the particular custom field and add the value ie. the URL of the image that is to be fetched. Accordingly one can fetch the the images by enabling the Featured Image option. One can also enter the order for the attached images where the images will be fetched from the Attached image order option. Similarly one can fetch the images inside the Post/ Page using the Scan content option. By default this option is disabled. One can either enable and disable the options from the image source from where the images are to be fetched from the Post. Following these simple steps one can fetch the images from the post and accordingly create WordPress Sliders very easily.